Every summer I seem to find myself purchasing a great deal of make-up which promises to make me look and feel like I am wearing no make-up. It seems quite counterproductive now I am writing it down but I’m sure I’m not the only women who strives for the ‘au natural’ look in summer where your friends tell you your skin looks flawless and glowing and you avoid telling them its expensive tinted moisturiser. So with my 2011 ‘au natural’ mission beginning as the summer months approach, I’m pleased to say I have found what I think will be my go to powder of the season – E.L.F Studio High Definition Powder. I should start by saying I really really like powder and very rarely apply make-up without finishing and fixing it with either a pressed or loose powder. During the winter my powder of choice was Mac Studio Fix, which I have been finding a little too heavy looking for the warmer weather we have been blessed with recently. 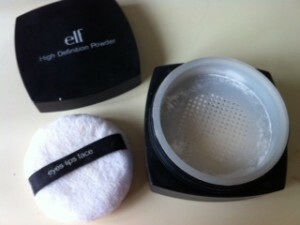 After hearing largely positive reviews of E.L.F Studio High Definition Powder I decided to see what all of the fuss was about and ordered myself a pot for the very reasonable price of £6. Firstly I have to mention what is the only negative and the elephant in the room, otherwise known as the ENORMOUS packaging. The design itself is fine, clean, simple and no complaints there but the actual pot takes up about 50 per cent of my travel make-up bag and is not really practical for either carrying with you during the day or on a night out for touch ups. However, with that said I would rather have bad packaging, good product as opposed to vice versa and this is what we have here. First Impressions – The powder itself is stark white in colour but when buffed in it turns completely translucent so this is nothing to worry about. The powder is also more finally milled than loose powders I have used in the past and it is these ‘microfine’ particles which make the powder great for high-definition camera technology (I.e photos which will be put on social networking sites) and everyday wear. How does it look? – When applied this powder really minimised my pores, gave my skin a velvety smooth appearance and it also seemed to have a brightening effect. One of the other positives was that even though it mattifies the skin slightly it doesn’t completely eliminate the dewy fresh look of some foundations and tinted moisturisers. Staying power – I apply a good load of this once in the morning to fix and finish my make-up this seems to last me throughout the day even in hot and sunny weather. It also helps to control occasional oiliness on my forehead.